First of all, I’m just someone who loves games and is an amateur game maker,but I’m trying to write some comments about my latest weird game. It explores some unusual themes related to the way our brains process stimuli – I had no intention of offending anyone through it. The theme and concept of this game is in no way meant to be a mean-spirited joke. 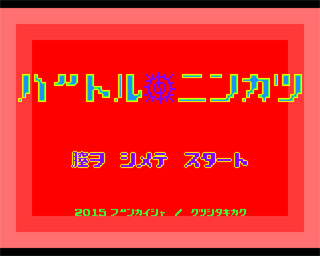 This game was created for a Japanese underground art exhibition which was held from February 13 to 15, 2015. It’s called “GEHIN DE SAITEI TEN”, which means “obscene and disgusting exhibition”. This exhibition has been held in Sapporo for 10 years. The theme behind it is: “every kinds of art which has obscene motifs”. The game system consists of a 15 inch monitor, stereo speakers and a phallic-shaped controller. This game is for women only; if you want to play it, you must make use of the controller in a “hands free” manner. 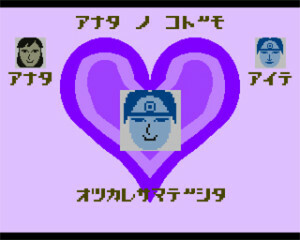 Title screen. The title is “BATORU-NINKATSU”It means “Battle for fertilizing” Making an avatar before the game starts. Choosing a partner. You can choose from 3 types. Doctor, soldier, and handsome boy. It’s a bird’s eye-view scrolling maze game. You must guide a protagonist to the goal before his energy runs out. Of course there are many obstacles you have to avoid in the maze. 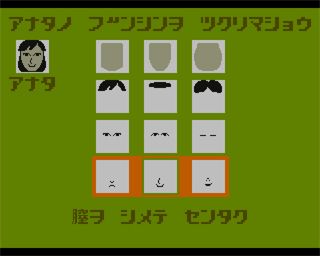 The protagonist is controlled using only one switch, which can be either on or off. This switch will be turned on when you throttle the controller by constricting it, such as with a cylindrical bodily muscle. 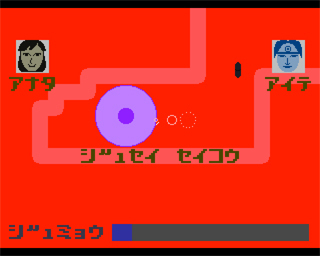 When you turn the switch on, the player will rotate on their current position; when you turn the switch off, the player starts to go straight ahead, in its chosen direction. Exploring the “ostium of uterus” The protagonist succeeds in reaching an ovum. You can see the future of your child. This game has two characteristic points, which might produce strange and complicated feelings of dizziness in players. First, as I mentioned before, it requires using the female form to use the controller. 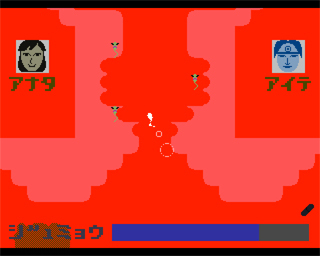 Second, a female player is controlling a sperm as the protagonist. The purpose of this game is to explore inside a player’s womb to find an ovum and fertilize it. This means players will experience the game in the role of a “foreign entity” working against themselves. These two aspects might be totally new experiences for players. In this sense, those are the most important factors of this game. Why did I make this game? What is the ultimate point of videogames? That you can be a brave hero? That you can perform mass destruction in a regal way? Is it to create every item imaginable within a digital sandbox? Or perhaps surviving bullet hell to get the highest points in the world? When we concentrate to kill creatures from outer space, or zombies, we don’t truly care about it, because our physical actions have no connection with that of our avatars. For example, when a protagonist in the game turns towards the enemy, we do not turn own body but simply push a cursor key. And we’re not allowed to fire guns within our modern social system, so we just tap a fire button instead. And so, we can act as diehard barbarians or legendary soldiers in videogames, without any feeling of wrongness. There is a disconnect between players and their avatars. 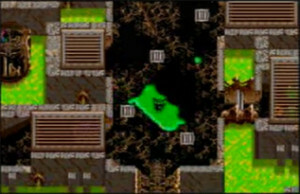 For a concrete example of what I mean, I’d like to refer to “The Ooze” which is a weird but underrated game for the Sega Mega Drive. The protagonist of this game is a green slime. His body can grow by getting items, but he loses his slimy body when he touches enemies or goes upon drains. The sensation or feeling you have when playing this game is really strange, because the player is amorphous. His body is so different from ours. However, we still feel a sense of “ouch!” or “it hurt!” when Mr. Ooze loses his body. 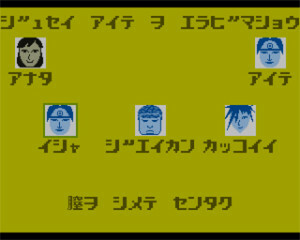 Another example is “Libble Rabble”, which is an unusual game for arcades (unfortunately it was released only in Japan). 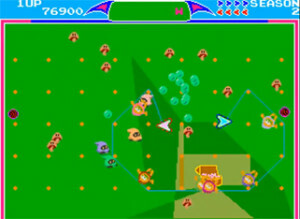 In this game we have to control two characters at once, simultaneously, to surround targets by drawing a line around them (try to imagine something similar to Qix, but with two free-roaming player-controlled icons). Even watching videos of the game you can feel your brain become stimulated. It’s not only those two examples, there are many games which require complicated control skills beyond what our bodies are accustomed to. Of course we have a feeling of discomfort when playing those games at first, but after we accept the new controller systems, we can control protagonists as if they were our own bodies. But why is this? It’s because a “processing system” works between the control of our hands and our visual perception. 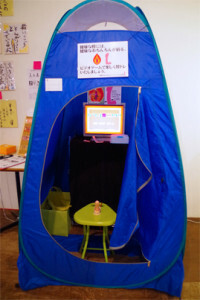 It converts a game character’s activity into sensations of direct experience. Without needing cutting-edge VR systems, we already have the greatest VR system built-in to ourselves – it’s the human brain. So, I think games are the best medium that allow us to feel the wonder of our brain as a processing system. On the other hand, we have various organs to approach our external environment. Not only hands or legs, but there is the mouth, tongue, skin, and other bodily muscles. So, I thought we don’t have to use only our hands or legs. We can use any organs for the game. Here is another viewpoint. I said our brain is the greatest VR system, but there is one big difference from cutting-edge technology. Its amazing capacity for learning. Our VR system requires a lot of experiences in order to construct new skill routines within our brains. A simple example is riding a bicycle, where once you’ve learnt how, the brain retains those new neural pathways. As a result, even if the protagonists of games are beyond the human body, we can still feel the worlds of games in a natural way. In other words, it can be argued that we can acquire new bodies which mankind has never had. So, I thought if we use organs that we’ve never used for playing games, we might learn new abilities that we haven’t acquired ever. And the process of getting those skills might show us a totally new world. To me this sounds really exciting. This is the reason I tried to make this game.